Here's an unusual wine I found in New Zealand: Sparkling Sauvignon Blanc! It's not a freaky experiment by some tiny winery. 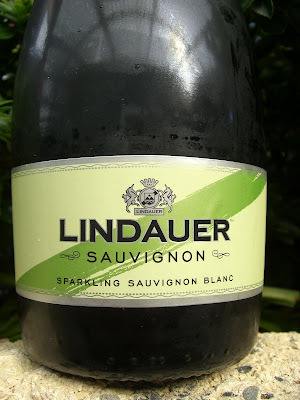 Lindauer is a brand owned by Montana Wines, the largest winery by far in New Zealand (and in fact, Montana is owned by Pernod Ricard). I don't know how much sparkling Sauvignon Blanc they make, but I saw this stuff everywhere on the South Island, including on some wine lists in tiny local pubs. 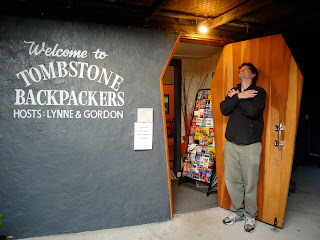 The first time I saw it, I bought a bottle ($8 NZ, less than $6 US) in a supermarket and immediately took it back to Tombstone Backpackers to share with the proprietors. I confess that I thought I'd mock it, and $6 is a small price to pay to have a good wine joke to tell. In fact, I liked it, which shouldn't have surprised me because I love Sauvignon Blanc and I love sparkling wine. Who knew these two great tastes are great together? What's next -- sparkling chocolate? Anyway, it tastes exactly like a good mass-produced Marlborough Sauvignon Blanc -- passion fruit, some fresh herb, gooseberry -- and has bubbles. As most bubblies in this price range aren't very good, I think it's great value, and am not surprised by its widespread acceptance in Kiwi country. The wine geek in me wondered how it's made. Most grapes grown for sparkling wine are picked early to maintain their acidity through two rounds of fermentation. But when you pick Sauvignon Blanc early, it's extremely herbaceous. That's why when I bought it, I expected it to taste like sparkling bell pepper (ewwww). But it didn't. As it turns out, it takes a big wine company with its fingers in many areas to make this wine a reality. The grapes come from different regions, and Montana has enough of them to spare to make this wine without worrying about hurting its main product lines. The wine is only 85% Sauvignon Blanc, which is picked at 21.5 Brix, not really underripe for Marlborough. Adding 14% Chardonnay and 1% Pinot Noir (both from Gisborne) makes it drinkable bubbly in a number of ways. The Chard was picked at 18.0 Brix, so it both brings down the alcohol (the wine is a reasonable 12% alcohol) and helps boost the acidity. The Chard and Pinot go through full malolactic fermentation, giving the mouthfeel some roundness. A spokesman for Pernod Ricard said there are no plans to export this to the U.S. anytime soon, so you'll have to fly to New Zealand to try it. But if you are there, give it a whirl. I did, and look at the impression on me!